(DrEddyClinic News) The government's solution to almost every environmental, pest, and agricultural problem is to simply throw more chemicals at it. But this misguided -- and upon further review, sinister -- approach always fails to actually solve the underlying issue, as is once again being evidenced by the rapid rise of malaria-carrying, "superbug" mosquitoes that have developed resistance to the insecticide chemicals that were supposedly designed to eradicate them. The unmitigated spread of malaria in many parts of the world is very serious, particularly throughout Africa where more than half a million individuals, many of whom are young children, reportedly die every year from infection (http://www.netsforlifeafrica.org/malaria/malaria-statistics). But insecticide-laced mosquito nets, aerial sprayings, and other chemical-based intervention methods have literally spawned an entirely new breed of superbug mosquitoes that no longer respond to these so-called solutions. 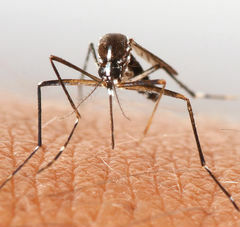 A study published last year, for instance, found that in one area of Senegal, a country on Africa's western coast, superbug malaria-mosquitoes emerged almost immediately after bed-nets treated with deltamethrin, a pyrethroid insecticide, were introduced there. Pyrethroids have been the insecticides of choice for most health agencies, and yet they are now being shown to be a complete failure. "These countries are characterized by high levels of malaria transmission and widespread reports of resistance," said Dr. Margaret Chan, Director-General for Communicable Diseases at the World Health Organization (WHO), concerning a number of other areas affected by resistance not only in Africa, but also in India. These two nations, after all, have been hit the hardest by malaria, and they are also seeing a major uptick in superbug resistance. One would think that, based on their track record of failure and actually making the problem worse, insecticides would be the last thing on the minds of health authorities trying to eradicate malaria. But WHO and others not only continue to defend the use of pyrethroids and other insecticides, but they are also pushing for the development of new pesticides. Why are they doing this? As we all know, government agencies in both the U.S. and elsewhere have been largely infiltrated by corporations with ulterior agendas and motives that typically have nothing to do with protecting or promoting public health. And this appears to be the case with WHO and its approach to eradicating malaria. "The World Health Organization (WHO) and World Governments are not fighting to stop malaria, or reduce the threat of mosquito infections; they are fighting to sell chemicals and other false solutions to health problems in the world," writes one Reuters commenter named umojaresearch. According to this poster, who identifies himself by the name of John, a real, viable solution to eradicating malaria was proposed back in 1925 by Dr. Charles A. R. Campbell -- but this solution was squelched by powerful interests.